I often tell my kids that they are the best Henry, Charlotte, Violet I could have ever hoped for or dreamed of. And we did, we dreamed of and hoped for each of our kids and with so many odds that were against us, each of them is a miracle. Henry and Charlotte are the kids that made us parents, we weren’t sure that day would ever come and after years of wanting and trying everything, we finally got the news that our ivf had worked. I remember picking up the phone message, pulling into the parking lot of the little church near us, and calling back to make them tell me again in person cause I didn’t believe it. I remember the tears of joy. Now when you are having twins and they offer you that first trimester screening, your results are even more hazy than a singleton. Nuchal fold and blood work showed that we had a 1:4 chance of one or both of them having Down syndrome, maybe.., if things weren’t too skewed.., which you couldn’t be sure of with twins… So we held hands, drove away, shed another tear or two, said it wouldn’t matter to us if one of them did have Down syndrome so we decided to skip any further testing, and picked out names. The pregnancy was amazing and blissful as I happily ate for three! 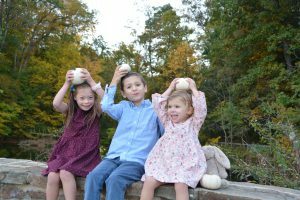 Even before they were born, my twins were a team as I would have to drink orange juice to get my kick counts in; Henry always came through right away and then I would wait for Charlotte to move when Henry would nudge or kick her! I’m still waiting for the nudging and kicking each other to stop! 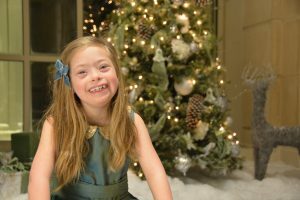 At their birth, it was pretty clear when she was born that our little Sweets very likely had Down syndrome with Al coming over as she was being checked and wrapped up to say that it seemed a likely diagnosis. After we got a brief cuddle with her, she was off to the NICU and the next day we had a visit from Dr. B. He came in to talk about their suspected diagnosis and gave us the news and information in a wonderful, positive light. He also said that he was sure we were a little busy at the moment (our twins were born on May 13) but there happened to be this great little event called the Buddy walk that weekend and if we weren’t going to make it this year, definitely go out for it then next year! So after that there were a few sad, confused tears and hushed conversations in the middle of the night when the fear really can get a hold of you but those were truly brief. They were acknowledged to ourselves and to each other and we thankfully were able to let them go only to have the overflowing joy fill in where those few cracks had been. These were the kids we had dreamed about about, this was the daughter we had wanted and now cherished, and yet she was so much more than I could have ever even imagined. It was challenging at first but I often remind people who marvel at twins, that they were our first – we blissfully didn’t know any different! Henry came home with us and Charlotte stayed for a month in the NICU and she went in a few months later for open heart surgery at AI. 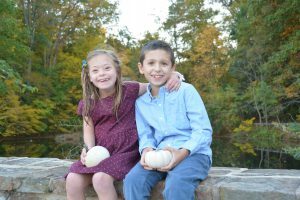 Throughout it all, the tiredness, the new parent learning curve, the Down syndrome learning curve, we had these kids and they had each other. They shared a crib, they explored their world, they learned to sit, roll over, crawl, and walk together, and throughout it all, Charlotte had Henry leading the way. It comes up that parents worry about their child falling behind or not keeping up with their peers and here we were with a direct comparison of what a kid the same age as Charlotte can do, day in and day out. But that was a push for Charlotte! There wasn’t a thing Henry did that she didn’t want to do to: See Henry pull up on the couch? She wanted to do that too! Run outside in the grass? Hold my hand and let’s get running mom! Over the past 7 years, they have attended different schools and gone to the same school, been in the same grades, and are now a year apart academically and still that push is there, Henry is reading? I’m going to grab my book and let’s practice! And as amazing as they are together, their differences are so cool too. Henry is more cautious, while Charlotte can be a daredevil – I don’t think she has seen a step or ledge she doesn’t want to jump off. Henry will talk a mile a minute while Charlotte may say a million words with her eyes before she opens her mouth. Henry wants to do thing perfectly while Charlotte is a more intuitive soul. And yet for all their differences, they are a dynamic little duo and all the better for having each other. Very briefly before I finish, I have to mention Violet. As amazing as the twins are and as great a little team, having Violet made everything so much more. Charlotte has such a great connection with her and loves being a big sister and shares interests with her that she doesn’t with Henry. Where Henry may take on more of a role in looking out for Charlotte, she now gets to take on that role with Violet and the pride and love she can pass on is beautiful to see. I tell my kids they are more than I could have ever hoped for and I mean it with everything I have in me and that I have to give to them. Before any of our kids were born, you wonder and try to picture them, imagine how time spent with them will be, what kinds of things will interest them and what conversations will you have? Maybe I didn’t picture Down syndrome, but I did picture my Charlotte and Wow, is she better than anything I ever dreamed up. Her smile is brighter than the sun, her hugs so joyous, her voice so endearing, her jokes so corny, her strength so impressive, and her eyes are just like mine. I look at her and my heart swells; she is the the very best and I am so glad she is mine. About the Author: Katie Orr is mom to her kids, twins Henry and Charlotte (7) and Violet (3). She is a Delaware native and works at Winterthur Museum where she and her family live. She can often be found running her kids around, dreaming of their next family trip, spending too much time on pinterest, jogging, reading a book, or visiting a museum.